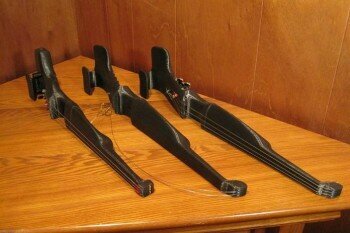 Introducing the F-F-Fiddle; a fully 3D printable electric violin. David Perry, a mechanical engineer, together with his friend Dan Nicholson, an industrial designer, set out to make the 3D printed fiddle after purchasing a 3D printer. Their goal was to inspire others and to demonstrate that it is possible to make functional and inexpensive items with a 3D printer. The resulting creation is a fused filament fabrication, full-sized electric violin that can be printed using any standard 3D desktop printer for around $250. The fiddle functions like any other violin, and sounds as good as any other fiddle would – in the right hands, that is! The original F-F-Fiddle was designed using the Autodesk’s Fusion 360 CAD design software. Perry then used Netfabb Basic to manage data for 3D printing, and finally, the model was sliced and prepared for 3D printer using Slic3r, KISSlicer, and Repeteir-Host. With each revision, the fiddle became more and more functional until it got to the point where it was playable. The current model is the fifth revision, and was printed on a Type A Machines Series 1 3D printer. Another version was printed on a Makerbot Replicator 2. The F-F-Fiddle is licensed under the Creative Commons Attribution Share Alike, which allows anyone to modify, distribute, and sell the design. Travis is an all around geek with a love for technology and he has been involved with 3D printing for several years. Besides 3D printing he also writes book reviews and about comic books. You can follow Travis on Google+ or @TStarnes on twitter. DigiFabCon Explores how tools like 3DPrinting are changing the world! 3D Printing Experts: Talk to 100,000 Readers a Month! If you know your way around 3D printers or 3D modeling, whether you are a user, engineer, salesperson, vendor or blogger, we'd love to have you write an article for us. We are getting about 3,000 readers a day and growing quickly. Interested? Click here..